strongest originals to date (Waiting For) with another top notch remix from Deepfunk. The release earned support from: Hernan Cattaneo, Nick Warren, Microtrauma, Cid Inc., Marc Poppcke and more. 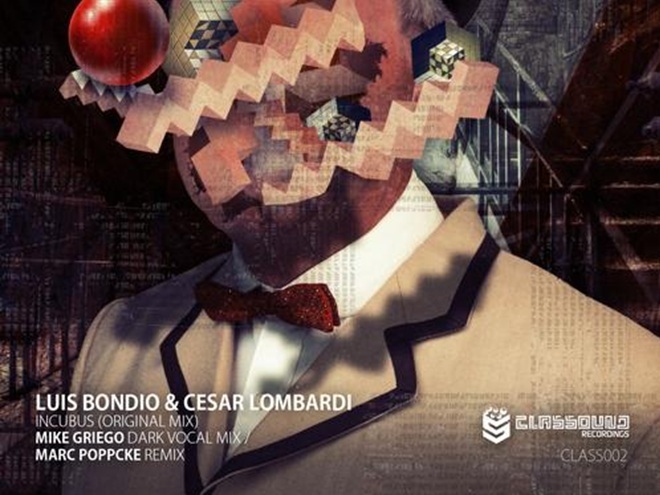 Now for Classound`s first release of 2013 and second overall we see label boss Luis Bondio teaming up with one of his regular studio collaborators Cesar Lombardi. The two have worked together a few times in the past and the results have always been spectacular. Their newest studio creation is entitled ‘Incubus’ and it comes with two amazing remixes from: Mike Griego and Marc Poppcke. Luis and Cesar`s original begins with a deeply rooted groove of subterranean quality. Electronic accents with a lovely aquatic polish soon bubble up around the framework and add a tremendous amount of bounce to the production as it moves forward. Delicate pads and soft rhythmic tones add to the atmosphere and groove respectively as the track reaches the main breakdown. The break is short and serves to escalate the angelic sounding pads to heighten those already tasked dance floor emotions. The bubbly aquatics sound absolutely deadly as the break reaches its climax and the rolling groove thunders forward. The remaining third of the record is really powerful with the aforementioned aquatics playing havoc on your senses and ultimately lighting up your dance floor in the process. Easily one of Luis and Cesar’s best productions to date. The first remix comes from Mike Griego who we have been big fans of for quite some time now. Mike hails from Argentina and his releases on Nick Warren’s Hope Recordings and Cid inc’s Replug have been absolutely sensational. This is Mike’s first appearance on Classound and his ‘Dark Vocal’ remix of Incubus has turned out magnificently. A grinding, electric sounding bass line sits at the foundation which more than provides a wicked groove early on. A plethora of metallic electronics soon get scattered around the framework for what results in a wicked vibe. The track flows through a short transition where some chord changes come over the bass line, this leads to the introduction of some heavily processed vocal trails which just add to the sinister nature of the track. A set of delicate tones fill the centre section of the record which provide a cool, melancholic stretch before those epic chord changes reappear and push the emotions higher for the ultimate climax. A really complex track from Mike with so many cool ideas and themes. Outstanding work.